This flourless vegan chocolate cake calls for only 4 ingredients and has the texture of a rich chocolate truffle. It's a fast and easy no-bake dessert! Grease an 8- or 9-inch spring form pan with oil, and then line the bottom with parchment paper to ensure that your cake will be easily removed. The smaller of a pan you use, the thicker your cake will be. In a small saucepan over medium-high heat, bring the coconut milk to a boil. Turn off the heat and add in the dark chocolate chips and vanilla, then let the mixture rest for a few minutes so the chocolate can melt. Stir well until smooth. Pour the chocolate mixture into the lined pan and use a spatula to smooth the top. 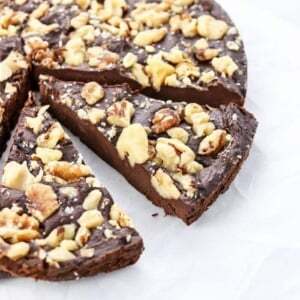 Sprinkle the walnuts over the top, and gently use your hands to press them into the chocolate filling. Place the pan in the fridge or freezer to chill until firm, about 2 hours in the fridge, or just 1 hour in the freezer. Use a hot knife to slice the cake into small slices. This cake is very rich, so a little piece will leave you feeling satisfied. If you have the air conditioning on in your home, you can store and serve this cake at room temperature for 3 days, but for best shelf life I'd recommend storing it in the fridge and then bringing it to room temperature before serving. When stored in an airtight container in the fridge, it should keep well for up to 2 weeks-- if you don't eat it all before then!